3Istituto dei Sistemi Complessi, Consiglio Nazionale delle Ricerche, Sesto Fiorentino (FI), Italy. 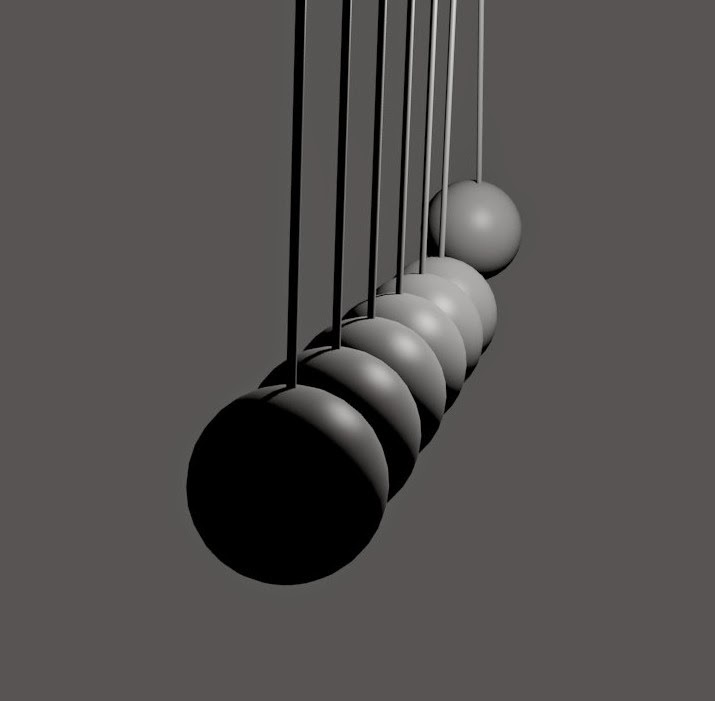 Newton’s cradle (Fig. 1) is a valuable paradigm of how physical mechanisms are concealed into nature. It is a device based on classical mechanics that demonstrates the conservation of momentum and energy. On the other hand, Quantum Mechanics has been shown to be one of most prolific sources of unexpected and hard-to-understand phenomena. Therefore, achieving a machine which is a paradigm for the quantum nature of a system is an engrossing challenge. modelling the contacts between the spheres. The above requirements, which are necessary for realizing a quantum NC (QNC), can be achieved with a system of cold atoms trapped in a one-dimensional periodic potential. This system can be built by confining a Bose-Einstein condensate into a one-dimensional tube using an optical potential that constrains it to a strict Tonks-Girardeau regime. The first achievement of this regime in Bose-Einstein condensates has been reached in the remarkable experiment by Paredes et al. , with a set-up closely similar to the one considered here. A further optical potential of moderate amplitude, is superimposed along the longitudinal direction, so that it generates an optical lattice that fulfills condition (i). The dynamics of this system is effectively described by a one dimensional Bose-Hubbard model  where, due to the Tonks-Girardeau regime, the strong repulsive interaction between the atoms prevents the double occupancy of lattice sites . In our proposal the condensate is made of atoms with two possible internal states, say |0> and |1>. Accordingly, each potential well hosts an effective two-state system (ii) and the wave-function at each lattice site is a superposition of these internal states. 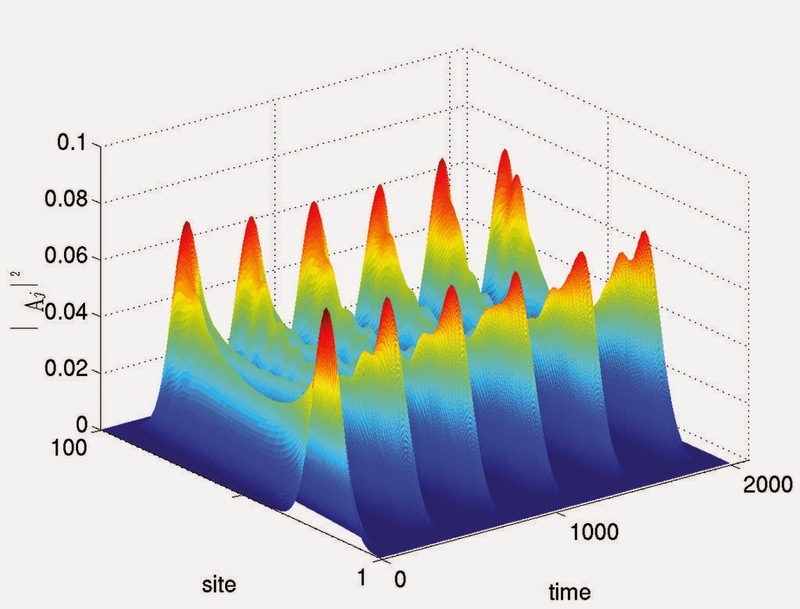 The tunnelling interaction between nearby wells can be globally tuned by the intensity of the optical lattice beam, and provides the required coupling which meets condition (iii). We have shown that a local perturbation generated at one end of such a lattice propagates back and forth between the lattice ends in a way very similar to that in which an initial momentum pulse is periodically exchanged between the endpoint spheres of the classical NC. 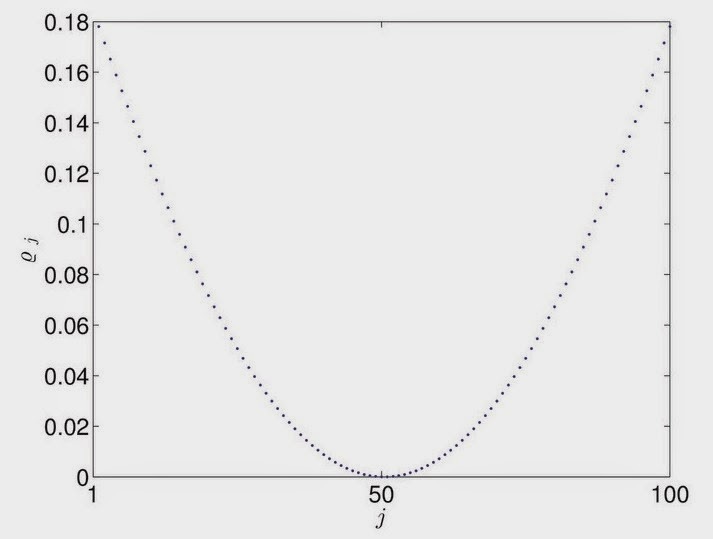 In fact, in the QNC the role of the classical momentum Δp transferred between the chain ends, is played by the wave-function disturbance ΔΨ which is transmitted through the system. We start with the lattice prepared with all sites in (say) the |0> state, and the initial disturbance ΔΨ consists in changing the first site to the |1> state: the disturbance will propagate through the `sea' of |0> states (the analogy is shown in Fig. 2). The system of atoms with two internal states has to be subjected to a strong transverse trapping potential and to a further standing-wave laser beam that creates a periodic potential in the longitudinal direction. At low temperatures and for sufficiently strong transversal and longitudinal potentials the system excitations are confined to the lowest Bloch band. The low-energy Hamiltonian is then given (see ) by the Bose-Hubbard model for two boson species labeled by α=0,1. In one dimension the homogeneous Bose–Hubbard model, has two remarkable limits: i) the case of a vanishing repulsion, the model reproduces two independent ideal Bose gases on a lattice, and ii) the case of strong repulsive interaction, that we consider here with a number of atoms equal to the number of sites (filling one). In the Tonks-Girardeau regime, an ideal Fermi gas is found. In fact, very high values of repulsion entail such a high amount of energy for accumulating more than one atom in a given site, that no site can be doubly occupied. Therefore, the only observable states are those where the occupancy of any site is equal to one. The two possible one-atom states at a site j are |0>j, and |1>j, and correspond to the jth atom in the internal state 0 or 1, respectively. In this way the dynamics is ruled by only internal states and an effective Pauli exclusion is realized. During an oscillation of the classical NC there are several spheres at rest and in contact with each other, and some moving spheres. When a moving sphere hits a sphere at rest, the latter keeps being at rest and exchanges its momentum with the nearby sphere (see video 1). In the quantum analogue of the NC the role of the spheres’ momenta is played by the wave-functions at each site. Rather than the transfer of mechanical momentum, in the quantum system there is a transmission along the lattice of a disturbance of the wave-function. This is represented in video 2. Furthermore, in the place of the spheres oscillating at the boundaries of the chain, we expect to observe the oscillation of the wave-function amplitude on the lattice ends due to the disturbance that runs forward and back. The system’s wave-function at each lattice site j can be a superposition of the two atomic internal states |0>j and |1>j. Under the analogy we propose, one can for instance associate to the spheres at rest the states |0>j. Accordingly, a moving sphere, let us say the first one, corresponds to a state a0|0>+a1|1>, a superposition of the two internal states. In terms of atoms this amounts to considering all sites initially populated by a species-0 atom, but for (a partial superposition with) a species-1 atom in the first site. This setup triggers oscillations whose dynamics essentially consists in the disturbance travelling along the lattice: the solitary species-1 atom propagates through the chain of species-0 atoms and migrates until the opposite end, where it is reflected back -- thus determining the NC effect (see video 2). Remarkably, this analogue of the classical propagation is described in terms of fermions: the most ‘non-classical’ particles. In the simplest case all tunneling interactions are equal and the chain is uniform. In Fig. 3 it is clearly shown that the initial disturbance of the wave-function travels along the chain in the form of a wave-packet, which reaches the opposite end of the chain and is reflected backward. 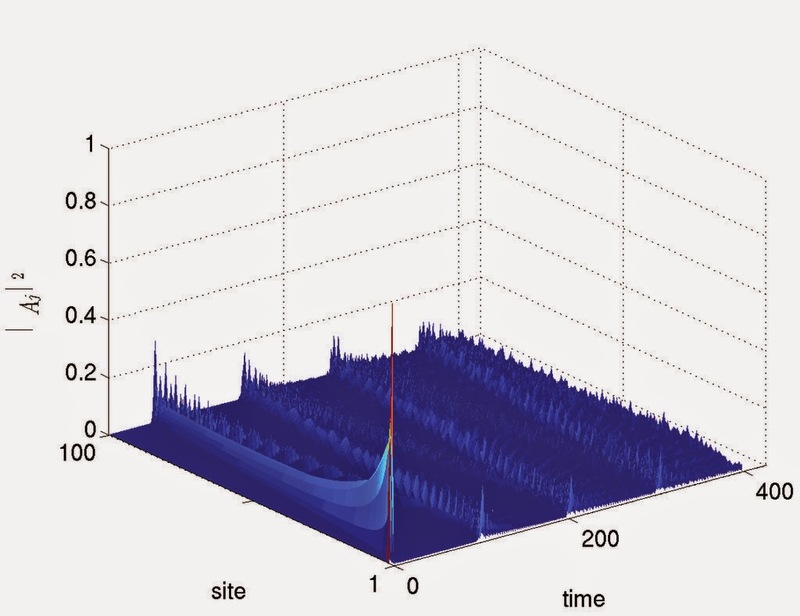 However, one can clearly see a significant attenuation of the transmitted signal, an effect essentially due to the destructive interference of the wave-function components. In other words, after a few bounces the initial state evolves to a state where the species-1 atom is delocalized along the chain. This is the situation that occurs in a dispersive system: the wave-function spreads over the lattice during time and the initial wave-packet is rapidly lost. A similar phenomenon also occurs in the classical NC if the masses of the spheres are not identical, i.e., in the non-uniform case. Evidently, in the quantum analogue, the uniformity of the system causes dispersion: therefore, it is important to identify under which conditions such attenuation can be minimized. The dynamic decoherence of the uniform case, can be not only reduced but even eliminated by letting the tunneling amplitudes to vary along the chain with well-defined nonuniform values. In fact, in the case of a system of M lattice sites, a dispersionless end-to-end quantum-state transmission can be obtained, when the Hamiltonian has nearest-neighbour couplings given by τj ∝[j(M-j)]1/2. In this case a perfect QNC is realized, whose behaviour is illustrated in Fig. 4. One has to observe that the accurate tuning of each tunnel coupling, is experimentally hard. We are going to show here that it is possible to minimally modify the least demanding uniform lattice in order to strongly improve the cradle’s performance. A simple way exists for the actual realization of a high-quality QNC in an essentially uniform chain, such that the need for engineering is small. A natural strategy is that of weakening the extremal τjs. Indeed, keeping the requirement of a mirror-symmetric chain, one can minimally modify a uniform chain taking equal couplings, τj=τ, but for the ones at the edges, τ1=τM-1=xτ, with x<1, and look for the best transfer conditions. In Ref. it is shown that the optimal coupling results x≈1.03M-1/6. As a matter of fact, taking into play also the second bonds τ2=τM-2=yτ allows one to guarantee a response larger than 0.987 (i.e., the transmitted amplitude deteriorates of only 1.3%) when the coupling are tuned as x≈2M-1/3 & y≈23/4M-1/6, see Ref.. The last configuration we propose can also be implemented in an experiment. 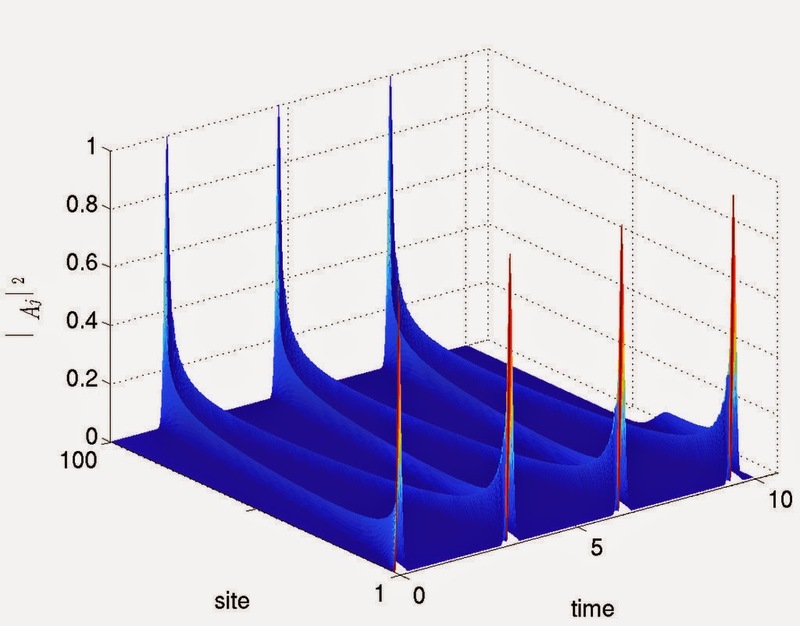 Besides the uniform one-dimensional optical potential, we add a trapping potential that generates a site-dependent energy-offset with a Gaussian profile (see Fig. 5). Furthermore, we choose as initial state a Gaussian wave-packet along the lattice. Such a setup appears to be the most realistic compared with the previous ones. In fact, in the schemes we illustrated so far, the bounce of the disturbance of the wave-function at the lattice ends is caused by the open-boundary conditions, while in the present setup, the wave-packet oscillates inside the trapping potential and its speed inversion is caused by the forces generated by the trapping potential. In Fig.6 it is evident that the packet never reaches the lattice ends: when the wave-packet moves towards a lattice end, it is slowed down by the trapping potential, until the motion is inverted and the packet is accelerated in the opposite direction. We have investigated an experimental framework that could realize a quantum analogue of Newton's cradle, starting from a Bose–Einstein condensate of two atomic species in an optical lattice. We have shown that the tunneling between sites makes the system equivalent to a free-Fermion gas on a finite lattice. In these conditions, one can trigger at one lattice-end a disturbance that starts bouncing back and forth between the ends, just like the extremal spheres in the classical Newton cradle: the analogy associates the propagation of a wave-function disturbance with the transmission of mechanical momentum. However, in the quantum system the travelling wave undergoes decoherence, a phenomenon that makes a uniform lattice almost useless. On the contrary, it is known that a special arrangement of the tunneling amplitudes can even lead to a virtually perpetual cyclic bouncing. That's why we looked for compromises that minimized the required experimental adaptation of the interactions and, gave `almost' perfect quantum Newton cradles. Of course, the possibility of obtaining quantum systems that allow high-quality quantum-wave transmission is not only relevant from the speculative point of view, but also in the field of the realization of quantum devices like atomic interferometers, quantum memories, and quantum channels. Nevertheless, realizing the quantum Newton cradle we proposed would be stirring by itself for the insight it would give into the entangled beauty of quantum mechanics. 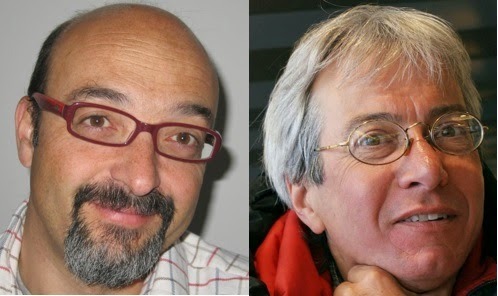 Roberto Franzosi and Ruggero Vaia, "Newton's cradle analogue with Bose–Einstein condensates". Journal of Physics B: Atomic, Molecular and Optical Physics, 47, 095303 (2014). Abstract. Belén Paredes, Artur Widera, Valentin Murg, Olaf Mandel, Simon Fölling, Ignacio Cirac, Gora V. Shlyapnikov, Theodor W. Hänsch, Immanuel Bloch, "Tonks–Girardeau gas of ultracold atoms in an optical lattice". Nature, 429, 277 (2004). Abstract. Roberto Franzosi, Vittorio Penna, Riccardo Zecchina, "Quantum dynamics of coupled bosonic wells within the Bose-Hubbard picture". International Journal of Modern Physics B, 14, 943-961 (2000). Abstract; Roberto Franzosi and Vittorio Penna, "Spectral properties of coupled Bose-Einstein condensates". Physical Review A, 63, 043609 (2001). Abstract. A. B. Kuklov and B. V. Svistunov, "Counterflow Superfluidity of Two-Species Ultracold Atoms in a Commensurate Optical Lattice". Physical Review Letters, 90, 100401 (2003). Abstract. L. Banchi, T. J. G. Apollaro, A. Cuccoli, R. Vaia and P. Verrucchi, "Long quantum channels for high-quality entanglement transfer". New Journal of Physics, 13, 123006 (2011). Abstract. T. J. G. Apollaro, L. Banchi, A. Cuccoli, R. Vaia, and P. Verrucchi, "99%-fidelity ballistic quantum-state transfer through long uniform channels". Physical Review A, 85, 052319 (2012). Abstract.